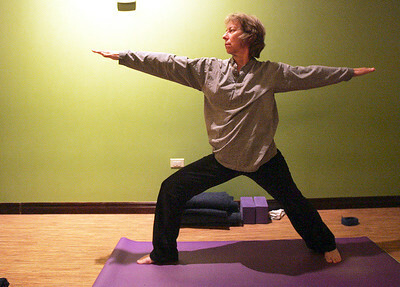 Monica Maschak - mmaschak@shawmedia.com June McHugh, a student in the Level 1 yoga class, does a Warrior 2 pose in the class at Yoga Seva in Crystal Lake. McHugh says she takes the class to better herself. 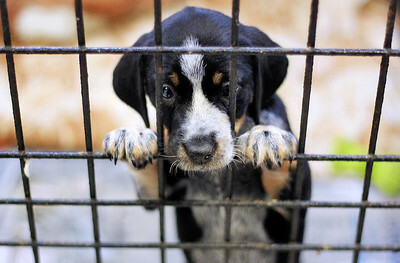 Sarah Nader - snader@shawmedia.com A six week old puppy climbs on his cage at the Assisi Animal Foundation in Crystal Lake on Wednesday, January 16, 2013. The puppy and his seven brothers and sisters and available to adoption. 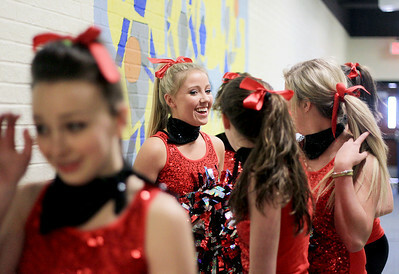 Sarah Nader - snader@shawmedia.com Jori Brockway (center), 16, of Johnsburg waits in the hall with the Johnsburg High School Dance Team before Thursday's pep rally for the Dance Team at the school on January 24, 2013. The Dance Team finished third at the Grayslake North Sectional will advance to the State Championship in Bloomington. 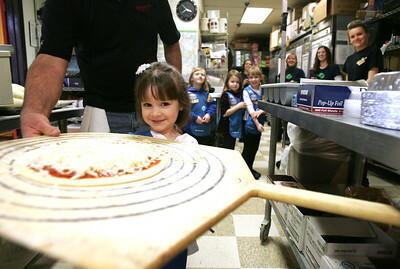 Monica Maschak - mmaschak@shawmedia.com Daisy girl scout Evie Howell carries her personal cheese pizza to the oven to be baked at Jimano's Pizzeria in Fox River Grove on Wednesday, January 23, 2013. The girls from girl Scout troop 1206 from Cary went to the pizza shop to learn about making pizza and each girl went home with her own pizza creation. Sarah Nader - snader@shawmedia.com Crossing guard Gloria Burchfield of Crystal Lake is bundled up with four layers of clothes while she waits for children to get out of school on the corner of Woodstock St. and Oak St. in Crystal Lake on Tuesday, January 22, 2013. 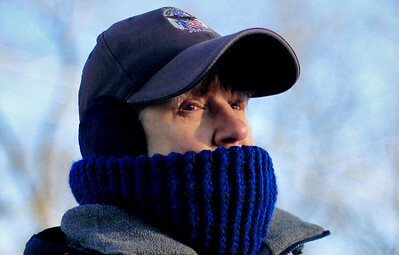 According to Accuweather.com, temperatures stayed in the single digits throughout the day and are expected to be in the low 20's on Wednesday. 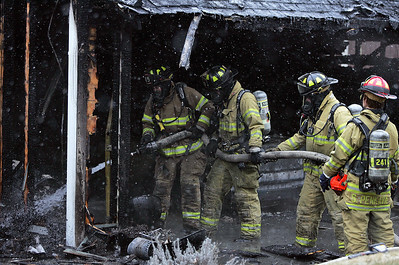 Monica Maschak - mmaschak@shawmedia.com Firefighters douse the remains of a Wauconda garage that caught on fire at 26703 N. Main Street shortly before 1 p.m. on Wednesday, January 23, 2013. Fifteen fire departments responded. The cause of the fire is still under investigation. There were no reported injuries. 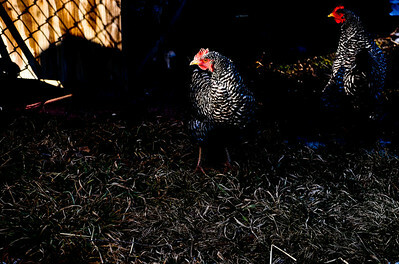 Josh Peckler - Jpeckler@shawmedia.com Barred Rock chickens stand outside the Fox Lake home of Rebecca Boettcher Friday, January 18, 2013. The Fox Lake Village Board voted against allowing single-family residences to raise chickens, but there are some residents who still raise chickens are their property. 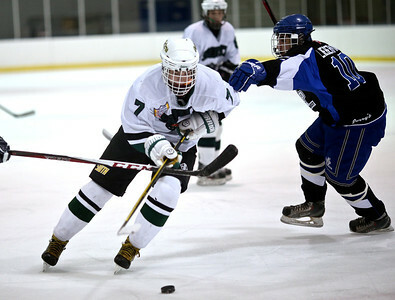 Josh Peckler - Jpeckler@shawmedia.com Crystal Lake South's Sean O'Neil (7) attempts to get past Highland Park defenders during the second period at Leafs Ice Centre in West Dundee Sunday, January 20, 2013. Monica Maschak - mmaschak@shawmedia.com Crystal Lake South's Stephanie Oros and Huntley's Ali Andrews take a tumble after fighting for control of the ball in the fourth quarter of Wednesday's close game. The Lady Red Raiders beat the Lady Gators 54-52 in double overtime. Monica Maschak - mmaschak@shawmedia.com Matthew Bridges, from Hampshire, fights for control of the ball in a game at Woodstock High School on Tuesday, January 22, 2013. 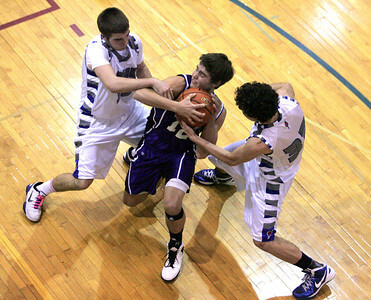 Hampshire won 64-49. 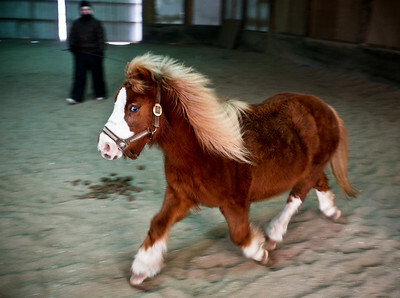 Josh Peckler - Jpeckler@shawmedia.com Opaline runs around inside a pen while exercising at Destination Safe Haven Horse Rescue in Marengo Sunday, January 20, 2013. Destination Safe Haven Horse Rescue will be holding their annual Cookies and Cocoa next Sunday, January 27 from 1 to 4 PM in Marengo where families can enjoy cookies, cocoa and tours of the rescue. The rescue is located at 1404 Busse Road in Marengo. Sarah Nader - snader@shawmedia.com T.J. Schock of Woodstock and his daughter, Emma, 3, try different yoga positions while attending Guy's Night Out at Verda Dierzen Learning Center in Woodstock on Thursday, January 17, 2013. Pre-K and kindergartens brought their "favorite big guys" for throwing and catching games, jumping, hopping and balancing activities along with yoga . 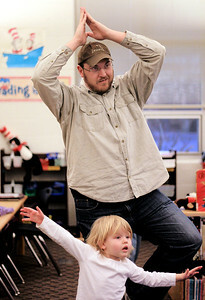 T.J. Schock of Woodstock and his daughter, Emma, 3, try different yoga positions while attending Guy's Night Out at Verda Dierzen Learning Center in Woodstock on Thursday, January 17, 2013. Pre-K and kindergartens brought their "favorite big guys" for throwing and catching games, jumping, hopping and balancing activities along with yoga .